Pests around the home aren’t just annoying, they can also be unhygienic and dangerous. They can cause safety issues and health problems to you, your family and your property. Pest-A-Kill WA is a locally owned and operated pest control business established in 1987. With over 30 years of experience, our clientele includes Residential, Commercial, Government, Real Estate & Mining. We use the latest products, technology and Australian Standard guidelines to achieve the best results in a safe and efficient manner. We are based in Geraldton, and service the Midwest region north to Denham, east to Meekatharra, Leinster, and south to Carnamah and Jurien Bay. Pest-A-Kill WA’s professional staff will travel to meet your pest management needs. Phone our friendly, qualified staff today to arrange a quote, book your next pest treatment or simply ask advice. Pre-purchase Timber Pest Inspection Reports. When it comes to controlling and eliminating pests, leave it up to the professionals and call the experts at Pest-A-Kill WA. 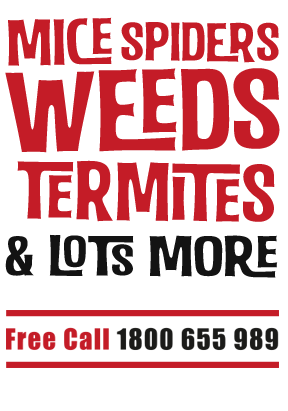 We offer prompt and professional pest management services in Geraldton and surrounding areas. Get in touch with the Pest A Kill team. Pest A Kill © 2019. All Rights Reserved.